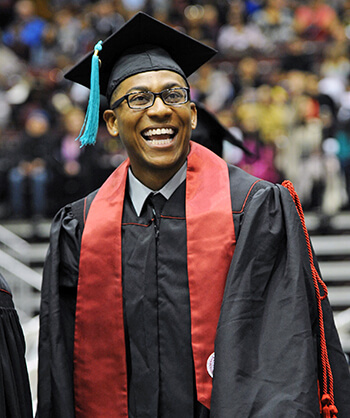 Indiana University Northwest will host its 53rd Annual Commencement on Thursday, May 9th beginning at 4 p.m. at the Genesis Center, located at 5th Avenue and Broadway in Gary. Arena doors open for guest seating at 2 p.m.
All degree candidates who wish to participate in Commencement must apply to graduate by contacting their academic units. Graduates will be robed in custom-made black rental gowns. Undergraduates will be able to keep the crimson satin “stole of remembrance” that is worn over the gown, as well as the cap and tassel. Order by Friday, March 8, 2019 to get the best price. An additional fee takes affect after March 8, 2019. Online orders close on Friday, March 22, 2019. IU Northwest will recognize those in active duty, National Guard, as well as reserves and veterans of the United States Armed Services. Service personnel, who represent the Army, Navy, Marines, and Air Force, are entitled to wear a twisted cord of red, white and blue. ROTC graduates who will commission on or immediately after graduation are also eligible. Armed Service Cords may be worn only by the individual in service; relatives, friends and beneficiaries are not eligible. Graduates should arrive at the Genesis Center at least 90 minutes (2:30 p.m. CST) before the ceremony begins and be ready to assemble by 3 p.m. Gowns must be returned immediately following the ceremony at the Genesis Center. The ceremony is expected to last about two hours. Tickets are not required for family members and friends to attend Commencement. Guests are encouraged to arrive and be seated by 3:45 p.m. if they wish to see the graduates process into the arena. All guest seating is on the 2nd level of the Genesis Center above the arena floor. Access to the 2nd level is available via stairs, escalator or elevator. Wheelchair accessible seating on the Main Level of the Arena floor is on a first come basis. Only one (1) family member may accompany the wheelchair bound guest - other family members must sit in the 2nd level of the arena. Handicapped guest seating will be halted between 3:40 pm - 4:00 pm while the graduates process into the arena. Limited mobility guests are encouraged to arrive early to allow ample time to be seated prior to the graduate procession. Seating for Hearing or Visually challenged guests may sit in Section 112 on the 2nd floor of the arena. IU Northwest graduates and their guests are invited to park at one of the free locations listed below. The university will provide its RedHawk Shuttle service to and from the Genesis Center with one stop at the Railcats east parking lot near Virginia Street. • Massachusetts Street (North): Located off of 5th Avenue at Massachusetts Street on the west side of the street. • Hudson Campbell: Located off of 5th Avenue at Massachusetts Street on the east side of the street. • Virginia Street (North): Located at the corner of 4th Avenue and Virginia Street on the east side of the street. • Virginia Street (South): Located at the corner of 5th Avenue and Virginia Street directly across from Hellman’s Tire Service. • Carolina Street (North): Located off of either 4th Avenue or 5th Avenue at Carolina Street. • Carolina Street (South): Located off of 5th Avenue and Carolina Street. The RedHawk Shuttle will drop off/pick-up directly in front of the Genesis Center. The shuttle will operate from 2 p.m. until 4 p.m., and will resume 15 minutes following the closing of Commencement and run for one hour. There will be two shuttles making rounds every five to 10 minutes. Designated free parking areas and the RedHawk Shuttle pick-up/drop-off location at the Railcats east parking lot near Virginia Street will be marked with signage. The Gary Police Department will be on hand to assist with traffic control. For more information on this year's graduation program, please refer to "Commencement 2019 - Need to Know"